Saturday, for those of you who have run it (if not, why not?) was the tenth anniversary of the founding of Parkrun. Not so much an athletics event, as a social movement, Parkun is an idea and a website. At about 290 locations in the UK it is possible to run a timed 5k in company, without charge, each Saturday, starting at 9am. Volunteers collect the runners’ times and enter them on a huge database. When I say “huge”, I do mean it: the last time I looked it the number of runners whose times had been logged was a staggering 549,859. Between us the UK parkrunners have run 5.2 million times, at a total running time of 267 years, and 211 days. We have covered, give or take, 26 million kilometres. 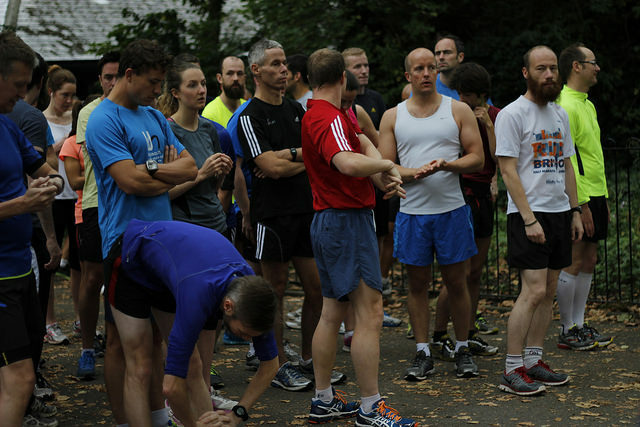 Parkrun has also spread to about 200 locations outside the UK. The 5k format turns out to be surprisingly fluid: whether that is the London parkrun which cuts through a marsh and is rumoured to be 50 metres under distance (making it ideal for personal bests) or the ones around it, on roads or parks, offering a variable mix of hills and flat. I have run at events in rural southern England where there were more people parkrunning on Saturday at 9 than could be found in the town centre 2 hours later. There are events in London where barely one in fifteen participants is a child, and events in Manchester where adults running with children are a clear majority and parkrun has become essentially a family affair. Parkrun is not advertised but spread by word of mouth. Extensive volunteering keeps the costs low. Being free to enter, it has something of the feel of the internet where, in general, the provider of free content “wins”. Occasionally, the local sports shop owner may come down and bid the runners welcome, but apart from that there is zero business involvement, no marketing, no message from the sponsors; in fact, it is hard to discern any sponsors at all. It is a superbly contemporary phenomenon – the Syriza or Podemos of participation sport. “if not, why not?” – a singularly threatening comment, which could be read as ageist or ablist.